Our second Lean Healthcare Summit takes place this year in Johannesburg. The Summit will again bring people working on process and quality improvement in healthcare together to learn, share and be inspired. Save 10% off your registration cost by registering a group of 3 or more people from your organisation. 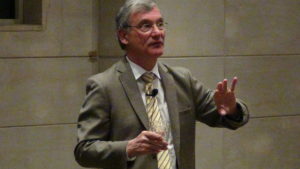 John Toussaint, former head of the Thedacare Group and current CEO of Catalysis, centre for healthcare improvement in the United States. Stefan Metzker, CEO of Swiss hospital Spital Männedorf, and member of the EU group of lean hospital directors. John Toussaint, CEO of Catalysis, answers questions at the Lean Healthcare Summit 2015. The Lean Healthcare Summit 2017 is the 2nd Healthcare Summit hosted by the Lean Institute Africa. The Summit brings local and international speakers together with lean practitioners to advance knowledge, gain inspiration and develop networking circles. At the Summit the latest lean thinking and practice in both the private and public health sector will be presented alongside valuable case studies. The Summit aims to present lean management to those who are new to it, and inspire and motivate those already using lean management in their organisations. 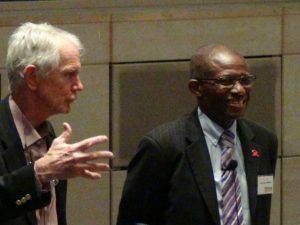 Prof. Faull, LIA Chairperson and G Dube, CEO of Leratong Hospital present at the Lean Healthcare Summit 2015. The theme of the Summit this year is “Empowering healthcare professionals through continuous improvement.” The programme has been carefully compiled to fulfil this statement. We are extremely honoured that two internationally renowned and highly experienced Lean practitioners, Dr John Toussaint and Dr Stefan Metzker, are joining us as keynote speakers. Dr. Toussaint is the CEO of Catalysis Healthcare, the first organisation of its kind to exclusively focus on educational programs and resources designed to transform healthcare value. Dr. Metzker is the CEO of Swiss Hospital Spital Männedorf and part of the European group of lean hospital directors. For further information on the Summit, please email Mia Faull at summit@lean.org.za. Alternatively get in touch with the Lean Institute Africa on 021 406 1477.